Start now saving on your money with this latest week sofa so good flyer, coupons, promotions, sales, offers, specials and deals. View the current sofa so good flyer to save on all products offerted by sofa so good ! Find all the deals & specials for sofa so good in the current flyer below. 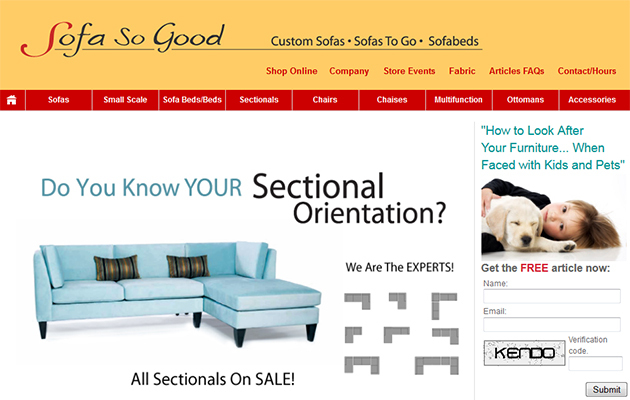 Sofa So Good is proud to offer you an extensive collection of “Made in Canada” upholstered sofas, sofa beds, sectionals and chairs. Our upholstered frames are made by Canadians for Canadians. Sofa So Good uses Canadian-made springs, wood (local) and foam to help drive our local economy forward. Staying local means less fuel and emissions by reducing transportation distances. Our Canadian manufacturers produce durable, quality furniture that gives you the most valuse for your investment. Sofa So Good;s seating will stand the test of time. Our upholstery selection includes Sofa, Studio Sofas, Love seats, Chaises, Chair 1/2, Chairs, Ottomans, Sectionals and Dining Chairs (Most are available with Sofabed and/or Storage options). To compliment these items; we also have an ever changing assortment of LAMPS, TABLES, RUGS, MIRRORS AND ACCESSORIES.